A few weeks ago, I had the pleasure of showing my friends Victoria and Steve of Bridges and Balloons around Liverpool. We were there filming this awesome video (check it out) and they asked me to show them all of my favourite places in the city. 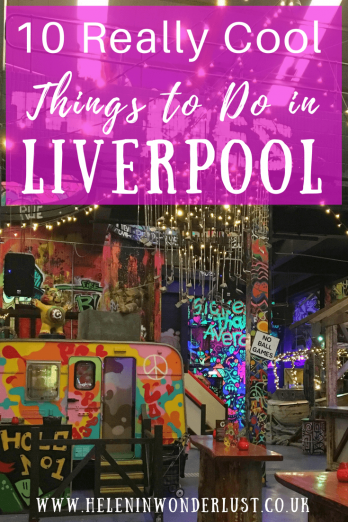 Liverpool is vibrant, fun and creative and you’ll never be short of things to do there, but here are a few of my top picks of some really cool activities to keep you entertained. If you’re looking for a fun activity, then Ghetto Golf is a great little place to go. 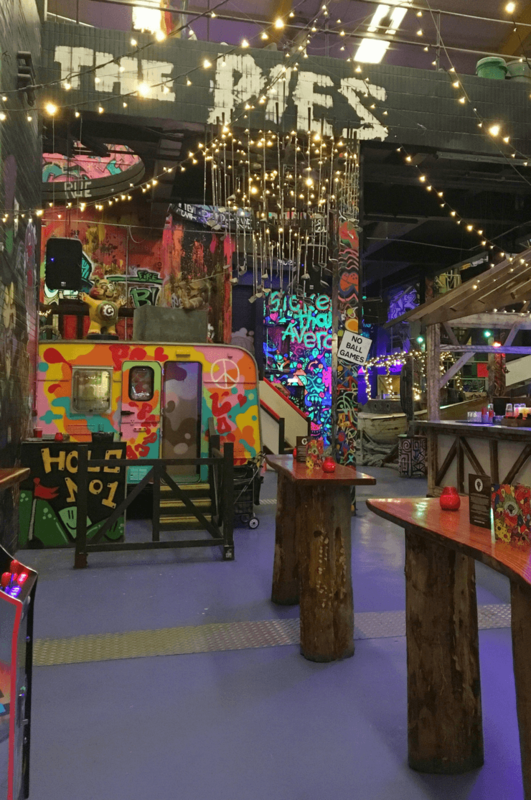 It’s an adults only, bar and crazy golf course with grafittied walls, fluorescent lighting and good cocktails called things like ‘Ghetto Superstar’, ‘Vanilla Ice’ and ‘Ghetto Gospel’. It’s housed in the old Cain’s Brewery so has an industrial feel and the design of the place is amazing, with weird and wonderful decoration at every turn, it’s pretty trippy! Wanna hang out with the cool kids? Head down to Camp & Furnace in the Baltic Triangle. This event space, bar and restaurant is the place to be in Liverpool at the moment and there are always different things happening there. 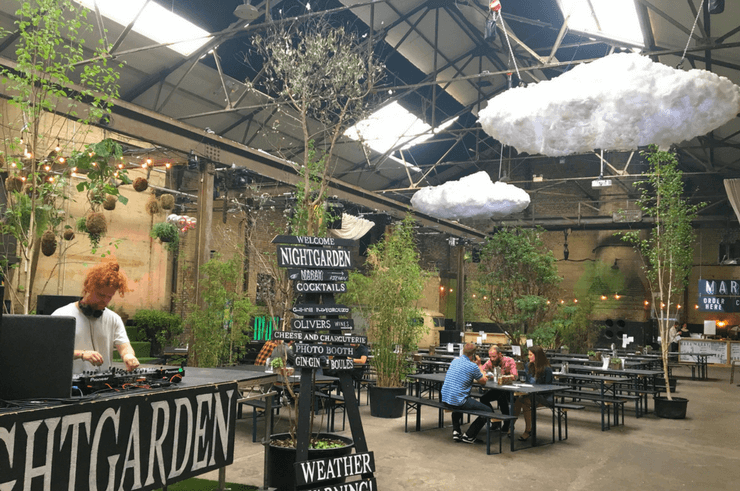 On Fridays they have the Nightgarden, where the place becomes a ‘glitch forest’ that combines, art music, performance, food and drink. They show big sports games at times and the place turns into a fanpark and it’s also the home of Bongo’s Bingo. You can check out their calendar here. They also do a really good roast dinner on Sundays! Posh indian Street food? Yes please! Mowgli is one of Liverpool’s best restaurants and it’s really reasonably priced too! There food is gorgeous and not the typical Indian food you find in the rest of the UK. This is proper Indian food! 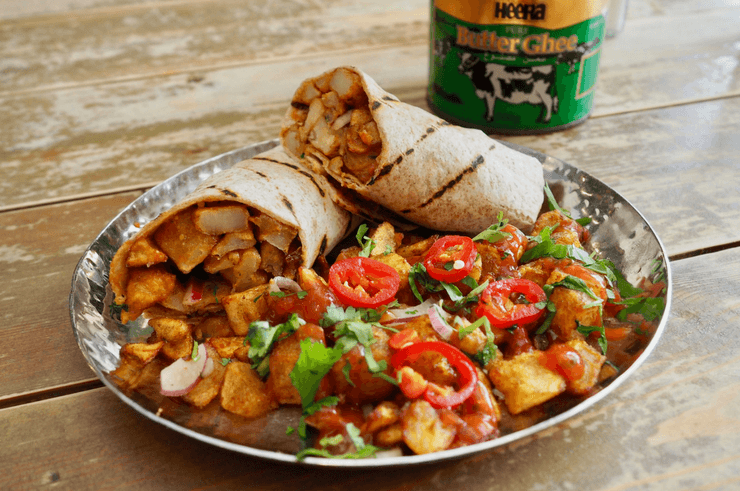 One of my personal favourites is the Mowgli Chip Butty, which is spicy potatoes in a chapati wrap – amazing! The first restaurant in Liverpool opened in 2014, then they opened a second Liverpool restaurant and one in Manchester. Leeds and Birmingham are coming soon. Just shows you how popular it’s become! Hope Street is my favourite street in Liverpool. For a start, it’s in Liverpool’s Georgian Quarter, which houses some of the best architecture in the city. It’s book-ended by Liverpool’s two beautiful and very different cathedrals. 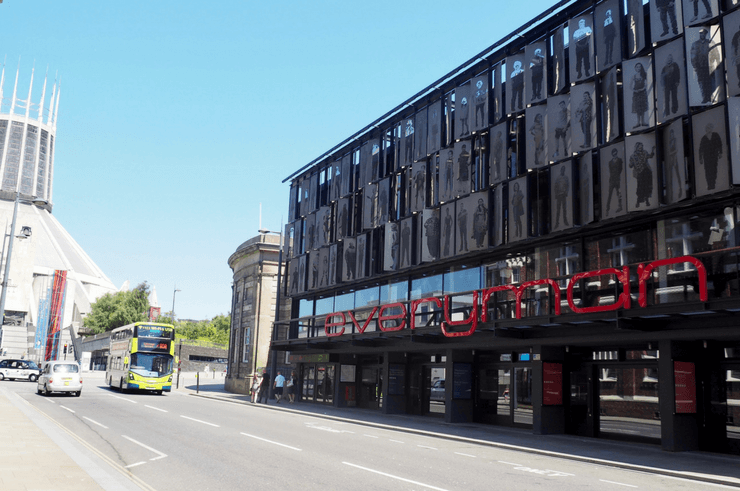 And it’s home to two of Liverpool’s best entertainment venues – the Everyman Theatre and the Liverpool Philharmonic. If your friends are visiting at Christmas, be sure to try and get tickets for the annual Rock n’ Roll panto at The Everyman. The cast are both the actors and the band, however the un-disputed stars of the show are X Adam Keast and panto dame, Francis Tucke. The show is great for adults and full of innuendos which go right over the kids heads. Absolutely hilarious. There are lots of great restaurants in the area too, one of my favourites being The Pen Factory, a laid back bistro, next to the theatre. 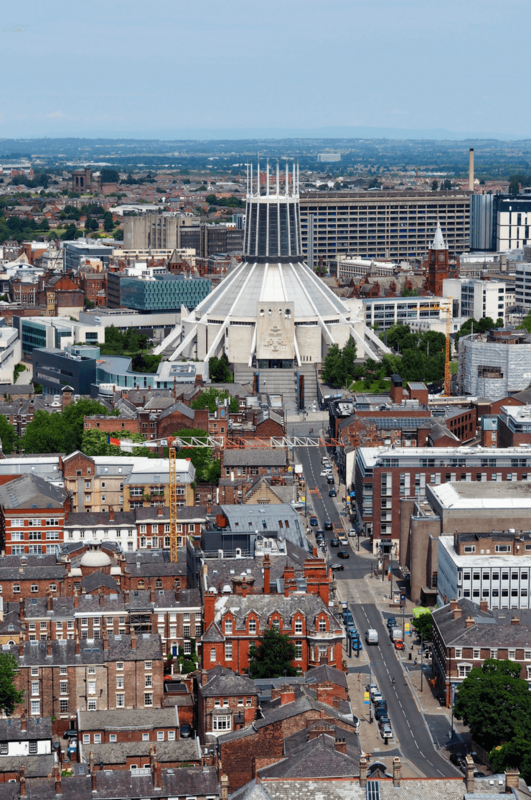 If you want to see Liverpool in all her glory, then there’s no better place than from the top of Liverpool Cathedral. For just a few pounds, you can head up the tower for amazing views of the whole city. 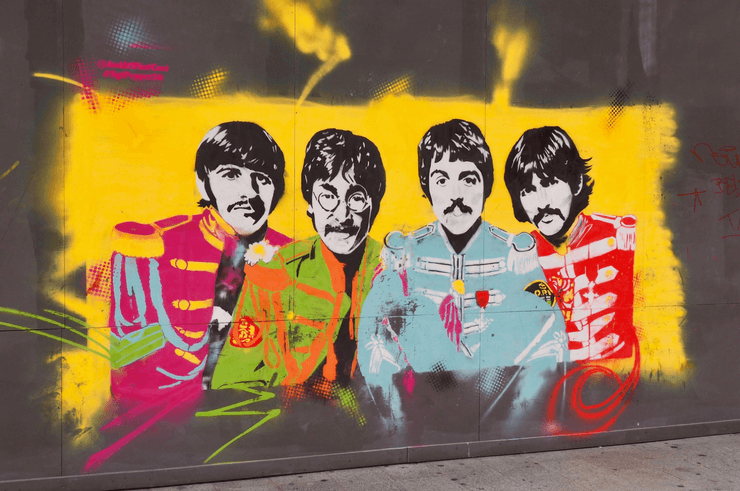 Liverpool is the home of The Beatles, as well as many other amazing bands such as Frankie goes to Hollywood and Gerry and the Pacemakers, and as such, music plays a big part of the culture of the city. My favourite places are Heebee Jeebies, the Baltic Social, Camp & Furnace and of course, The Cavern. 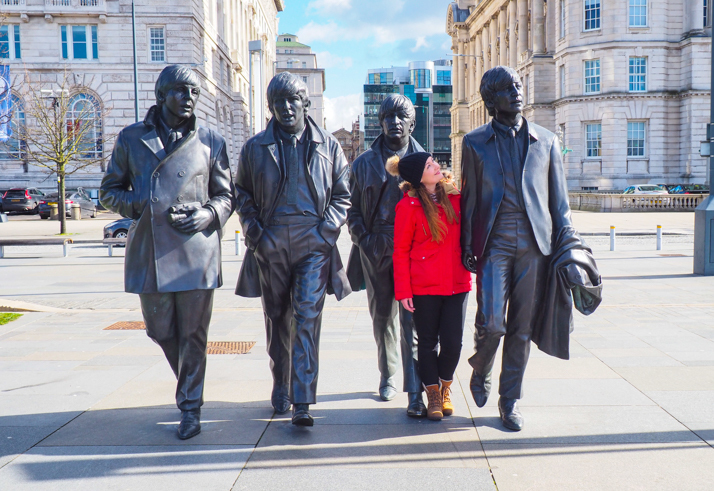 If you want to learn about the history of music in the city, we also have the British Music Experience and The Beatles Story. Both are great places to spend an hour or two! I guess you wouldn’t class Liverpool as a beach destination, but we do have a few in close proximity to the city. 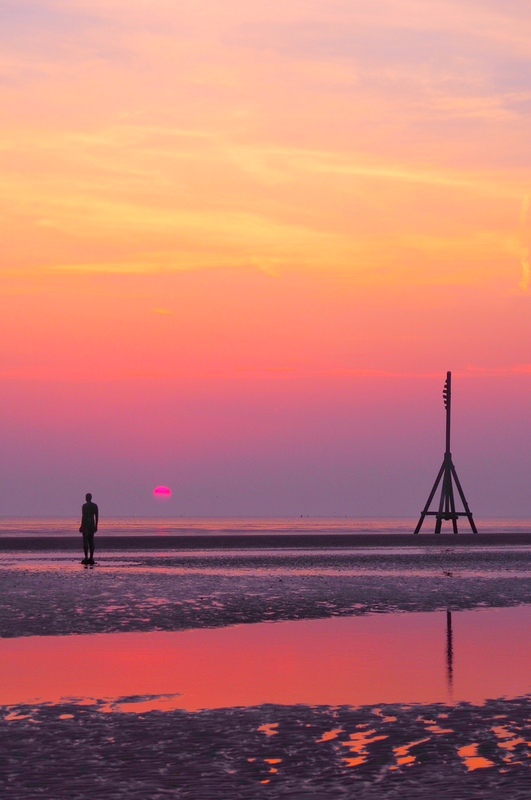 My favourite is Crosby beach, which is home to the Iron Men, the art installation by Antony Gormley. The beach itself is a bit sludgy and you can’t swim, but the sunsets can be incredible and the 100 Iron Men dotted along the beach make it a slightly surreal experience. Most days you can get ice cream and fish and chips which only add to the charm. To get there, take the train from Central Station or Moorfields to Waterloo. From there you can walk down to the beach. 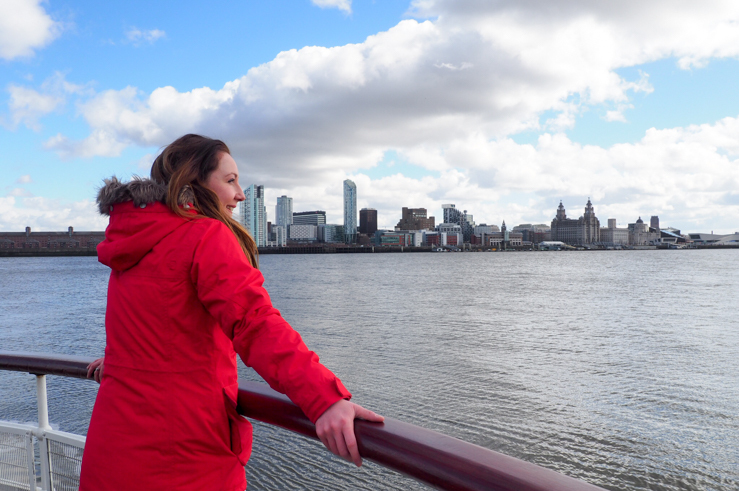 Liverpool has one of the best skylines in the world, so hop on a Ferry ‘Cross the Mersey and spend an hour on the river. You’ll get great views of the Pier Head and the Three Graces, the two cathedrals, the Echo Arena, the Albert Dock and the Liverpool Museum from here. Although it can be cold and windy, so bring your coat! Newly opened, the Baltic Market is Liverpool’s first food market. Now this one I haven’t been to yet (hence the random street art picture of the Beatles, which isn’t in the Baltic Market, it’s actually on Lord Street, just so you know), as it only opened since I’ve been in Africa, but it’s the brainchild of the guys behind Independent Liverpool, so I know it will be good and Liverpool has been crying out for something like this, so I’m so happy someone finally did it! The Baltic Market is also housed in the old Cain’s Brewery and just around the corner from Camp & Furnace. They have a number of street food and craft beers vendors. It’s open Thursday and Fridays (5pm – 11pm) and Saturday and Sundays (11am – 11pm). Being British, I love a good afternoon tea and Cuthbert’s is my favourite. Not only are the cakes, sandwiches and quiches amazing, but the place is wonderfully atmospheric too! 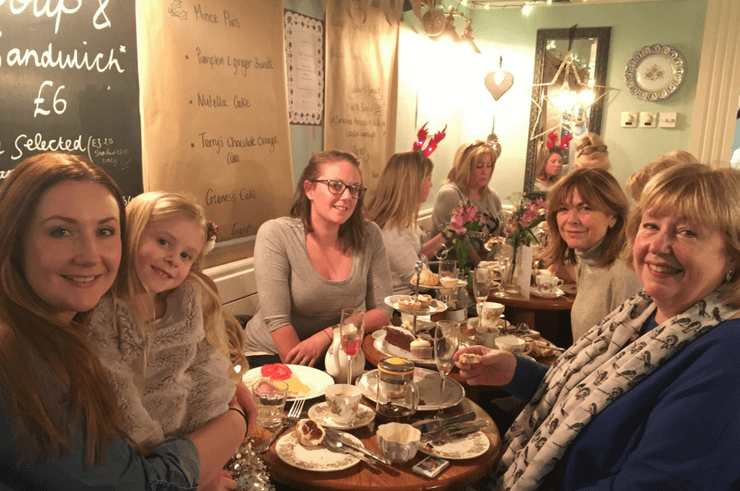 My favourite time to go is at Christmas, when I go with my mum, auntie, sister-in-law and niece. Last time we were there, the whole place broke out in a rendition of ‘White Christmas’. It was one of the most magical moments of my entire life. So there you have it! My top picks for Liverpool! Enjoy! 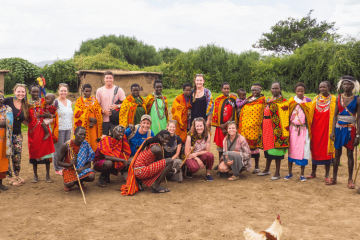 If you’d like to watch the video we made, you can see it here! If you know me, please don’t laugh at my posh TV voice! Have you been to Liverpool? Where are your favourite places? No idea how good Liverpool is but after going through the list and pictures, it seems it is a great place to visit. Liked the concept of night garden. Those hanging clouds looks lovely. Thanks for the info. My favourite book shop, News from Nowhere, down Bold Street is fantastic. Ita a non profit book shop that lromotes changing society. But if revoluntionary politivs aren’t your things, theres plenty of every day books and even a kid’s section. WOW! This is something which I was looking for! 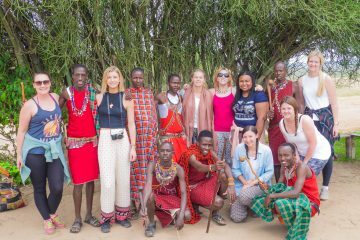 Great, its really awesome place and have so many good things to get fun. You shared amazing tips thank you. Very interesting article. A must-read for those who want to visit Liverpool. 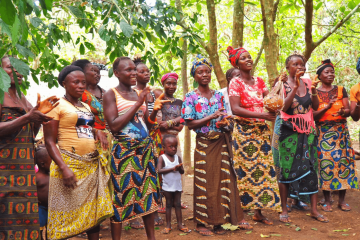 Very nice and interesting article. Would love to visit Liverpool after reading this for sure.